The war in Syria is significant in two ways. First, the outcome can reshape the Arab Middle East. Second, and perhaps more important, Syria is not simply about Syrians. The US, Russian, Iranian, Turkish, and French forces are engaged there along with the Islamic State (IS), al-Qaida, and secular Arabs. The Saudis and the rest of the Arab monarchies also exert political and economic influence on Syria. I have written in the past about how the growing crises in Eurasia are increasingly interacting. Syria is the place where that interaction is the greatest and most violent. Prior to World War II, there was a civil war in Spain. Nazi Germany and fascist Italy sent troops. The Soviet Union did as well. In addition, leftists from around the world flocked there to fight. The French and British refused to get involved, trying not to be drawn in. The Spanish Civil War was said to be a rehearsal for World War II. The major players of the European war were there—though some weren’t. New weapons were tried out. The civil war ended in April 1939, five months before Germany invaded Poland, which began World War II. Syria is drawing in major global and regional powers. When, for example, the US and Russia are engaged in a country—with very different goals and supporting hostile factions—it is certainly not something to dismiss out of hand. On the contrary, Syria matters a great deal. If nothing else, it has become a test of the strength of powers with interests far beyond Syria. There is a class of conflicts whose importance to us diminishes over time. These conflicts involve intense slaughter and suffering and generate endless conferences, meetings, and wringing of hands by global statesman. But these wars seem never-ending. Their origins are lost in the mists of time, the situations on the battlefield are hard to grasp, and they appear to have little consequence to the rest of the world. The relief workers do a heroic job and try to shame us into caring and giving, but in the end, each conflict seems to be just another war in a faraway place having little to do with our own lives. But Syria is far more than that. The current regime was founded by Hafez al-Assad, an air force general, in a military coup. He was an Alawite, part of the Shiite sect of Islam. He was also a secularist. Gamal Abdel Nasser, an Egyptian military officer, had staged a coup in Egypt in 1952 and wanted to create a state based on three principles: secularism, socialism, and Pan-Arabism. His vision was the creation not of a caliphate, but of a secular, socialist, unified Arab world, based on military rule. Many regimes were patterned on this, including Assad’s regime in Syria. But ideology aside, Assad represented the Alawite faction, and what he created was a state built around his faction. Other factions were excluded, oppressed, and not infrequently, killed. However, Alawites are only around 12% of the Syrian population, which was why he relied heavily on the minorities (Christians, mainstream Shiites, Ismailis, Kurds, and Druze) that together constitute 40% of the population. More important, he also relied on many Sunnis. Even today, the regime is alive because a lot of Sunnis have not rebelled against the state. Nevertheless, Assad kept Syria from fragmenting by suppressing any challenge to him. After he died, his son, Bashar al-Assad, kept running the family business. The Arab Spring in 2011 generated a challenge to his regime. The problem was that the opposition was deeply split. They spent as much time fighting each other as they spent fighting Assad. Democracy had little to do with it. The Alawite-Sunni split had a great deal to do with it. But the Assad regime had a lot of support. One of the misunderstandings of US foreign policy has been that tyrants rule only through the threat of violence. That is true, but in order to have a credible threat of violence, you have to have people who are prepared to carry that violence out. And they need to be loyal to you, or they may turn the violence against you. Tyrants do not live alone in isolated palaces. If they did, they wouldn’t live very long. The Alawites had done extremely well under the Assads. They dominated the military, trade, smuggling, and internal business. They were hated by many Sunnis, especially the more religiously inclined. The Alawites knew that if Assad fell, their position would collapse, and they would become the target. They, therefore, had to resist the uprising, and since they controlled the military, they believed they would not be defeated. Assad was not going to be overthrown by a wildly fragmented and poorly armed and trained opposition. The Assads had been a problem for the United States in many ways. They sent weapons and supplies into Iraq during the US occupation from 2003 to 2011. They helped destabilize Lebanon. They fought multiple wars with Israel. And above all, they were closely aligned with the Iranians, fellow Shiites. Hezbollah in Lebanon, also an ally of Iran and Syria, represented a terrorist threat for the US (even in 2011 when the Sunnis were the main enemy). When the Syrian war began, the US saw a chance to crack Assad, dramatically reduce Iranian influence in the region, and break Hezbollah. The problem was that the US didn’t want to get directly involved in the war, at least not excessively. Since most Sunni groups were jihadist, the US had to find groups that were anti-jihadist, anti-Iranian, and anti-Assad… and that were motivated to fight. The US was looking for secularists not aligned with Assad. It was, to say the least, difficult to find such a group. It was also hard to be certain that they would stay that kind of group, and that they wouldn’t sell the weapons they were given. Still, the US felt it had enough to gain to keep trying. At this point, IS emerged, seizing control of parts of Iraq and Syria. This put the US in a fix. If it brought Assad down, IS might extend its power. If it attacked IS, it would give Assad breathing room and alienate some of the opposition (some of which wanted an all-out attack on Assad while others didn’t want IS hindered). The US found itself “Waist Deep in the Big Muddy,” as the song about the Vietnam War went, and it had yet to create an effective opposition to Assad anyway. Then, the Russians became involved militarily. Russian intelligence had been close to the Assads since they took over in Syria. Russia did not want him to fall. But it had far greater problems than Assad. First, it suffered a strategic setback in a crucial buffer state, Ukraine, when a pro-Russian government was replaced by a pro-Western one. Attempts to foment an uprising in the east failed, and all Russia could claim was control over Crimea, where by treaty it had already based major force. Second, the collapse of oil prices had a massive impact on the economy that was going to pyramid. At the very least, President Vladimir Putin needed to demonstrate that, barring Ukraine, Russia was a major power. The military importance of his decision to deploy a relatively small number of aircraft and special forces in Syria was massively inflated by the Russians, who wanted to appear stronger than they were, and by the Americans, who wanted to make Russia out as an aggressor. Both approaches helped cement Russia’s role. Then, having deployed aircraft and troops, Russia confronted the same problem as the Americans. The Russians could not reshape the Syrian landscape, especially with US resistance. The US, Russia, and Iran were all active in Syria and unable to end the conflict. That left the Turks. The Turks hated the Assad regime, and when the Russians first intervened, the Turks shot down a Russian plane, causing a serious confrontation. Then, there was an attempted coup in Turkey, and the Turks turned against the Americans (who they partly blamed for the failed coup) and got closer to the Russians. Realizing that the Russians were inflexible on Assad, the Turks shifted back toward the Americans and were prepared to fight IS, but only if the US understood that the Turks had a simultaneous war underway with the Kurds. Syria did not simply draw players in. It sent huge numbers of migrants to Europe as well. This triggered a huge crisis in the European Union, dividing countries that wanted to block migration from those that would encourage it. This compounded already existing tensions in Europe over the economy. It is reasonable to say that Syrian migrants shaped the Brexit vote, encouraged the rise of radical nationalist groups throughout Europe, and redefined the underlying issues. The Paris terrorist attacks had another effect. The French sent an aircraft carrier to carry out airstrikes in Syria in cooperation with the United States. The Syrian migrants and the inability of European forces to block them, or to take effective unilateral action against IS after the attacks on Paris and other cities, generated not only greater military involvement in Syria, but long-term planning to manage the fallout from the conflict. Syria is a battleground in which the United States, Russia, Turkey, and Iran are increasingly involved. Watching barely on the sidelines are the Israelis and the Saudis, while Lebanon is constantly uncertain. Iraq is heavily influenced by what is happening in Syria, while the Kurds, facing IS in Iraq, are now facing Turkish forces in Turkey and Syria. And the Europeans are coping with a wave of terrorism and contemplating rearmament. All of this is driven by Syria, a country that seems gridlocked in a permanent and insoluble war. But it is a country that has brought together friends, enemies, and contenders for power in a small place. It reminds me of nothing as much as Spain in the 1930s. For the first time since the 1940s, all of Eurasia is unstable. Syria is not the pivot of this instability, but it is the showcase. Most major powers are there or nearby, except the Chinese. My eyes glaze over when I hear about Syria, yet they shouldn’t. I have to force myself to see the increasing importance of this test war. Here’s an interesting statistic: Since the end of March, more than 70% of This Week in Geopolitics issues have focused on countries and issues from the cradle of disorder. From North Korean strategy, to the EU post-Brexit, to power struggles in the Middle East, we’ve been looking resolutely east. This is no coincidence. Events in Europe, the Middle East, and Asia are a growing threat to world peace. “[T]he government has to take resources from someone before it can dole them out to others. The above quote is from Porter Stansberry – from his book, America 2020: The Survival Blueprint. It states a concept I’ve described for years, but Porter states it more succinctly than I ever have. In particular, it negates the argument by many “progressives” that, even if they don’t recommend full-on socialism, they believe in getting “just the right mix” of socialism and capitalism to create the ideal system. Unfortunately, as viable as this concept may sound, even moderate socialistic national policies result in moderate deterioration of the system. It’s not unlike being “just a little” addicted to heroin. It may be argued that, “That’s different. With heroin, the addict will always end up wanting more and he’ll become even more dependent.” Exactly so – and that’s unquestionably true for socialism as well. Once the concept of “free stuff” is part of a nation’s governing system, the desire for more free stuff will inexorably rise. And, of course, historically, we have seen that governments always step up to the plate whenever the demand for more free stuff is suggested. But why should this be so? Wouldn’t a more conservative government be less likely to proffer entitlements than a more liberal government? Actually, no. To believe this is to misunderstand the very nature of governance. Those who are governed like to believe that their government exists to serve them, and all political leaders are quick to encourage this perception. However, amongst themselves, political leaders fully understand that they exist primarily to feed off of and dominate the electorate. Of course, they can’t actually admit this, but, regardless of party affiliation, that is their very raison d'tre. A free-market society is beneficial, as it creates prosperity. It enriches the population with money, goods, and services. It also rewards those who are most productive. However, it does tend to leave behind those who are less productive, and here’s where political leaders find their opportunity to cash in. If I were running for office and declared that no one should own more than $10, I would not be elected, as most voters would quite rightfully regard me as a threat. But if I were to declare that “the greedy rich” have too much money and should be required to “give some back,” I might get all voters except Voter E to vote for me. For the man who is worth $1,000, the greedy rich are those who are worth $10,000 or more. But, likewise, the man worth $100 thinks of the greedy rich as those worth $1,000 or more. Human nature dictates that we don’t see ourselves as greedy, but it’s not too difficult for politicians to convince us that those who have more than us are greedy. Further, once we’re convinced of this, it’s not too difficult to fool us into believing that the greedy rich have, in some way, achieved this wealth by swindling us out of it. And, now that you mention it, yes, we would like to have some of it back, thank you. So, any population becomes an easy target for leaders who promise to take from the rich and “give back” to the less rich, like a modern-day Robin Hood. But what of that claim that “just the right mix” of socialism could take some away from the rich, but leave prosperity intact? And so, it’s the nature of governments (whether they claim to be conservative or liberal) to seek to increase the size of government annually (requiring ever-more revenue to pass through their hands) and to take an ever-greater part in the hands-on distribution of the nation’s wealth. All governments will do all they can to grow themselves, as it’s very much in their interest to do so. All governments will, regardless of their party rhetoric, continually pursue a greater level of socialistic policies. In this regard, political parties are interchangeable. The choice, really, is whether the individual is living in a jurisdiction where he believes the government has already become so socialistic that he’s a net loser, rather than a net recipient. Beyond this point, his future can only be on a downward trajectory. This is a most unpleasant conclusion to come to grips with, as it informs the individual not only of his current situation, but the rest of his life. In standing back and observing his entire future from a greater vantage point, he realises that, increasingly, he will be beating his head against the wall if he remains where he is. Those who internationalise do so with the understanding that, if they choose one country because it’s the most ideal to do banking in and choose another because it’s the most productive to invest in, they will prosper. At some point, they additionally realise that it’s also beneficial to apply that logic to their choice of country of residence. Throughout the life of anyone who advances himself, there’s a tendency to change neighbourhoods from time to time to attain a better quality of life. Yet most people drop this logic as soon as they reach the borders of the country they were born in. In truth, the decision to move beyond national borders to choose a neighbourhood – one where the system has not deteriorated to the point that it’s dramatically usurping the wealth of the individual – is not such a great leap. In fact, it’s relatively easy to do. In much of the former “free world,” socialism is here to stay, but the individual citizen needn’t be. He may vote with his feet and move to a better neighbourhood. Editor’s Note: Socialism often leads to economic and societal collapse, hyperinflation, shortages, and shrinking personal freedom. This has happened most recently in Venezuela. The truth is, it can happen anywhere. The U.S. is not immune. In fact, it’s extremely vulnerable. Increasing socialism, bad financial decisions, and massive debt levels will cause another financial crisis sooner rather than later. We believe the coming crash is going to be much worse, much longer, and very different than what we saw in 2008 and 2009. 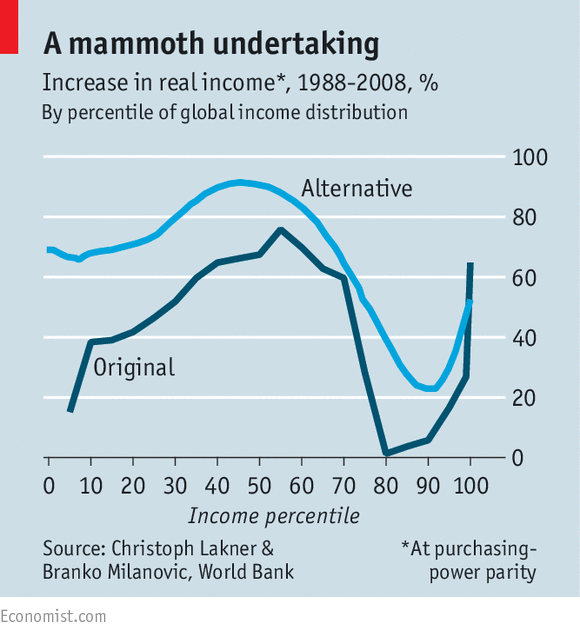 THE “elephant chart” began life in 2012, hidden in the middle of a World Bank working paper by Branko Milanovic, an authority on global inequality. It turned a few heads in the New York Times in 2014, then graced Mr Milanovic’s well-received book on global inequality earlier this year. Somewhere along the way it acquired its name, which helped it stampede across social media, brokers’ notes and even a ministerial speech this spring and summer. “I’m about to bring an elephant into the room. A wild, angry, and dangerous elephant,” joked Lilianne Ploumen, the Dutch trade minister, last month, before unveiling the chart to her audience. Now, its critics are trying to shoot it. The distinctively shaped chart summarised the results of a huge number (196) of household surveys across the world. It was created by ranking the world’s population, from the poorest 10% to the richest 1%, in 1988 and again in 2008. At each rank, the chart showed the growth in income between these two years, an era of “high globalisation” from the fall of the Berlin Wall to the fall of Lehman Brothers. When drawn for individual countries, charts of this kind tend to slant upwards (the rich gain more than the poor) or downwards. The global chart was unusual in sloping up, down, then upwards again, like an inverted S on its back, or an elephant raising its trunk. The chart showed big income gains at the middle and very top. But the era of globalisation seemed to offer little for the people in between: households in the 75th to 85th percentile of the income distribution (who were poorer than the top 15% but richer than everyone else) seemed scarcely better off in 2008 than they had been 20 years before. They constituted a decile of discontent, squeezed between their own countries’ plutocrats and Asia’s middle class. This dramatic dip in the chart seemed to explain a lot. “Cue Donald Trump. Cue nationalism. Cue Brexit,” wrote Mr Milanovic’s publisher. But who exactly occupies this dangerous decile? A report this week by Adam Corlett of the Resolution Foundation, a British think-tank, examines this group more closely, taking aim at some simplistic interpretations of the chart. Many people assume the chart shows how people in this controversial income bracket back in 1988 fared over the subsequent 20 years. But that is not quite the case. Instead it compares the people in this bracket in 1988 with people in the same bracket 20 years later. They may not be the same people. They may not belong to the same class. They may not even belong to the same country. What accounts for the changing constituents of each income bracket? Fast growth will, of course, carry people up the income ranks. Data, dissolution and demography also play a part. The countries included in the 1988 and 2008 rankings differ because data did not exist for both years or because the country did not (several emerged only after the Soviet Union dissolved). In addition, faster population growth among people in the lower reaches of the income distribution will automatically shunt everyone above them further up the income ranks, even without any improvement in their fortunes. To see why, imagine a simple world populated by 750m poor Southerners and 250m rich Northerners. Imagine that incomes do not change over the next 20 years, but the South’s population doubles. That would increase its share of mankind from 75% to over 85%. For that simple reason, in the 75th to 85th percentiles of the global income distribution poor Southerners would replace rich Northerners. Any comparison of this income bracket with the same bracket 20 years before would thus show a big decline in fortunes, even though no one is worse off. In reality, better-off Latin Americans and Westerners of modest means dominated the 75th-80th percentiles of the global income distribution in 1988. By 2008, rich Chinese had encroached upon this income bracket. The flat incomes shown by the elephant chart do not, then, reflect the stagnant fortunes of Trumpians and Brexiteers. They instead reflect a comparison between the original Latin American and Western occupants of this income bracket and the Chinese who jumped into it 20 years later. None of this will be new to readers of Mr Milanovic’s academic work. He and his co-author, Christoph Lakner, were quite clear about the shifting composition of the troublesome deciles. Their journal article also included an alternative chart, which does what many people assumed the elephant chart had done: it illustrates how each income group in each country in 1988 fared over the subsequent 20 years. In its shape, the chart looks recognisably elephantine. But the top 1% do markedly less well in this alternative chart than in the more famous one, and even the worst performing groups (now around the 90th percentile) boast income growth of 20% or more over 20 years. Both charts show that China’s middle classes and the world’s rich have gained handsomely in the era of globalisation. It also remains true that the lower middle classes in rich countries have fared less well. 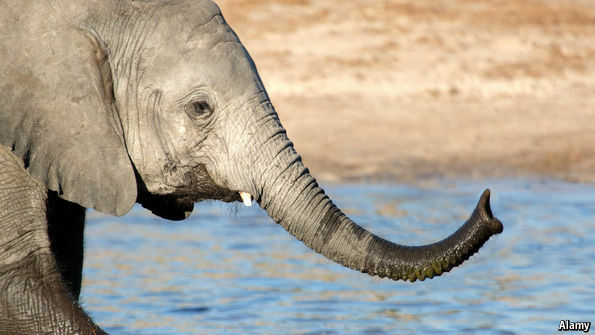 The elephant shape remains, even if its dimensions are different. The Resolution Foundation’s critique added little to the original academic papers (except a reason to go back and read them). But it clarified a misunderstanding shared by many of the pundits and drumbeaters who made such a noise about the rampaging chart. Like the elephant George Orwell described in a famous essay about his time as a colonial policeman in Burma, this one was shot chiefly to silence a crowd. The prices of both metals were down again this week. We would guess that it has something to do with the fact that everyone knows: higher rates are coming to the dollar. The yield on the 10-year Treasury closed the previous week at 1.762% and this week at 1.701%. It may not look like much, but this is a change of +1.7%. Just repeat after me: "the Fed makes the economy more stable." In any case, there are a few holes in the "bonds are in a bubble" bubble. One is that the worldwide trend for 35 years is falling rates. If one wishes to argue that this trend is over, one would have to acknowledge its cause and argue that this cause is no longer in effect (one would need a real theory, not just the old "inflation expectations" saw). More immediately, why are junk bonds and equities not dropping commensurately? If you look at a chart of junk bond yields, you see less volatility and the opposite trend. Since July 1, the Bloomberg High Yield Corporate Bond index is up 3.8%. In the same period, the Bloomberg US Treasury Bond Index is down 1.1%. When a bond price falls, that means the interest rate is higher. For reference, 6-month LIBOR is up from 0.92% to 1.25%, or +36% (thirty six, not a typo). We aren't bond or equity traders, but we think it's crystal clear that if rates are truly moving up, a lot, and durably, then all assets will be repriced lower. And if the US dollar is alone in bucking the falling rates trend, then look for a rising dollar index (i.e. all the other currencies will fall further, as traders will short them to get the even-greater interest rate differential). Needless to say, the idea of a rising dollar does not fit the bond-bubble-burst rising-rates Narrative. So for the moment, the prices of the metalsâ€”silver more than gold - are driven by this Narrative. How long until this Narrative bursts? There was an interesting news item this week, CME Group announced that it will presently launch a futures contract for the gold-silver ratio. This security will make it easier for the public to trade the gold-silver ratio. We think this is good, as it encourages arbitrage thinking. Of course, like every product in the market-casinos today, this one is designed to generate dollars (unlike our fund, which deals in physical metal, and generates gains in gold). We will have more to say about this contract as it gets closer to launch (Oct 24). Read on for the only true picture of the fundamentals of the monetary metals. But first, here's the graph of the metals' prices. Next, this is a graph of the gold price measured in silver, otherwise known as the gold to silver ratio. It did not change this week. Here is the gold graph. We switched from the October to December contract this week. The price of gold fell this week, as did the basis. The Monetary Metals fundamental price of gold is down just about as much as the market price. The price of silver dropped just as much as gold, in proportion. The basis dropped more. Our fundamental price is now two bucks under the market price. Does this mean the market price has to drop immediately, now that we know this? No, right now the market is in the grips of a mini silver mania (we would not dare say bubble, at least not without trigger warnings). Like the interest rate anomalies, it would be strange to see the price of silver take off like the famed mythological silver bug rocket while the price of gold languishes, moribund.